One of Us. A powerful phrase — belonging, kinship, camaraderie. Familiar concepts, though this book deals with them in ways you may not expect. Initially our protagonist, Hap Thompson, seems anything but One of Us. An outsider, a loner with no life, an ex-wife, forced to live in exile from his hometown. The reader begins to think that perhaps Smith means Us in the more intimate, author-reader sense. Everyone can identify with the character who feels his life has been wasted, his best years are behind him and he will never again live as fully as he once did. Hap is a REMTemp, an occupation whose legalities are still being wrangled out in court. He receives other people’s dreams, so that they may sleep untroubled. The process leaves him tired but wealthy, though the grey legal aspect means he must move from town to town, trusting no-one. Nevertheless, Hap has little reason to complain. He knows he screwed his own life up, and this is the best-paying job he’s ever had. Mustn’t grumble. Until, that is, his boss ‘persuades’ him to move into another, even more dubious area — memory receival. And one particular memory contains a murder, committed by a woman who has now disappeared. The murder of a police lieutenant. The book starts, like all good thrillers, in the middle. It is only through lengthy but natural exposition that we realise what has befallen Hap, about a quarter of the way through the book. Though by that time, after having discovered he is also being pursued by what can best be described as Men In Black for reasons unknown, we are so snowed under with questions, concepts and plot twists that we have far more on our plate to worry about. Spares, Smith’s previous novel, was a similar ‘one man’s quest to find the truth’ affair, but to compare further would be unfair. What we have here is an altogether more mature work, with less desire to shock and more emphasis on keeping the reader turning the pages, which Smith does admirably. His previously shown talent for a good plot and deft character is shown to full potential here in a story that contains more twists than any given John Grisham novel has in its little finger. Metaphorically speaking. Characters are equally well-handled. Hap is an eminently sympathetic man who we cannot help but feel for. Many of his internal dialogues and emotional outbursts will bring on sage nods and murmurs of, ‘Yep. Know that feeling.’ The supporting characters are crafted with similar skill, never crossing the line from archetype to stereotype. Not even the Amoral Head of an Evil Corp. So who is this for? 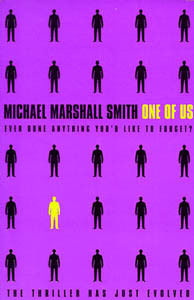 In an effort to help Smith’s work reach the audience it deserves, One of Us is very carefully described as a thriller, with barely any mention of the speculative elements. Even the jacket design is deliberately modern without appearing too ‘niche’. For once, though, this isn’t unfair — speculative technology is there to benefit the plot, not vice-versa. And to reach the (literal) revelation of the Men In Black’s real identity, such a massive and entirely different suspension of disbelief is necessary that the science fiction becomes almost ancillary. Yet another young British writer appears to have found a love for simply telling a cracking story instead of trying too hard to be clever. No bad thing. Will it work? It appears to have already done so — Smith has moved beyond the hard-core neo-cyberpunk audience he initially attracted, and is now seen as a mainstream writer. It’s very hard to pin down exactly who will like this book besides a glib, ‘Anyone who likes a good thriller,’ though that’s as much as I’ll commit to. Fans, if they can live with the shift of emphasis from speculation, will enjoy One of Us for Smith’s impressive skills of character and plot twisting. Newcomers will simply enjoy it for what it is — a cracking read. And the ‘Us’ in question? It’s not who you think. I promise you that.